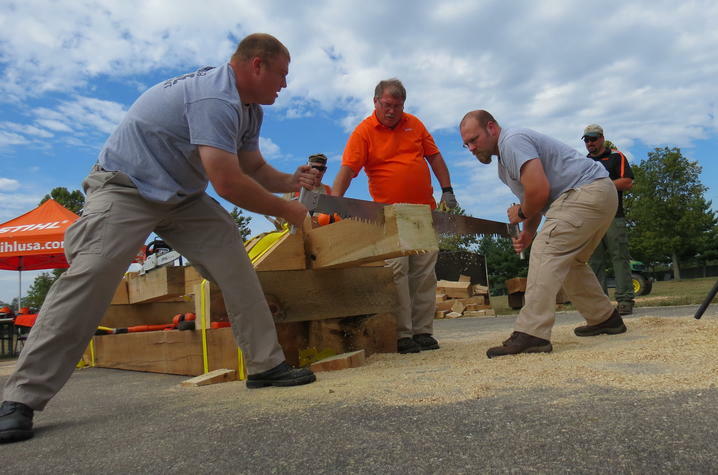 The Police/Fire Competition at the 2015 KY Wood Expo. Photo by Renee Williams. LEXINGTON, Ky., (Aug. 28, 2017) — The Kentucky Wood Expo returns to Masterson Station Park in Lexington Sept. 15 and 16, and the University of Kentucky Cooperative Extension Service will have a big hand in two days of educational and fun activities for the entire family. The biennial event, sponsored by the Kentucky Forest Industries Association, offers classes, competitions and more than 50 exhibits and demonstrations for everyone, from the forest professional to simple lovers of wood and wildlife. Sawmill, pallet, logging, secondary and wood processing machinery will be on display along with a wide range of support services. Logger education classes will be offered, as well as educational opportunities for woodland owners. Activities designed to interest everyone will include chain saw carving demonstrations, open lumberjack competitions, knuckleboom and skidder contests, log guess, craft displays and a silent auction to benefit the Log a Load for Kids and the Kentucky Children’s Hospital. 12:15 p.m. to 1 p.m. — "An Overview of Urban Wood Around the Country"
1 p.m. to 1:30 p.m. — "Local Opportunities for Urban Wood Utilizations"
1:45 p.m. to 2:15 p.m. — "Identifying External Defects and Recognizing the Underlying Internal Defect"
2:15 p.m. to 2:45 p.m. — "Log Grading and Bucking: Maximizing Value and Yield for Specific Markets"
3 p.m. to 3:30 p.m. — "Portable Sawmill Demonstration"
3:30 p.m. to 4 p.m. — "Dehumidification Dry Kilns"
9:20 a.m. to 11:20 a.m. — "Small Scale Logging: Cutting and Moving Logs Using ATVs and Tractors"
11:20 a.m. to noon — "Specialty and value-added products and marketing"
The two-hour, "Small Scale Logging" presentation will include exposure to general practices and equipment demonstrations to help landowners safely and efficiently cut and move logs and firewood. Demonstrations by exhibitors will include the use of ATV-mounted skidding plates, log arches, farm tractor log winches, ATV and tractor log loading trailers, chainsaw cutting and portable sawmilling. The program is available for Society of American Foresters and Master Logger credits. Other UK College of Agriculture, Food and Environment experts will offer sessions from 1 p.m. to 3 p.m. Saturday, Sept. 16, on backyard and smaller woodlands. Information covered will include the importance of backyard woods and useful resources for the landowner; caring for backyard water resources; shopping for the right tree; avoiding invasive plant species and the emerald ash borer; and wildlife habitat and damage control. On both days, free woodworking classes taught by UK Forestry’s Bobby Ammerman will offer a chance for attendees to make their own cutting board. A Critter Tent hosted by Steven Price, UK assistant professor of wildlife ecology, and Matt Springer, UK assistant extension professor of wildlife management, and UK Department of Entomology extension specialist Blake Newton, will have displays of mammals, reptiles, amphibians, insects and spiders. Visitors can learn about the critters’ ecology and management as well as about invasive insect species. UK students will compete against seven other universities and colleges in the 2017 Kentucky Wood Expo Conclave on Sept. 16. Comprised of 12 events, the conclave has both men’s and women’s competitions including the underhand chop, stock chainsaw, axe-throwing and manual sawing, both single and pairs. Though not required, participants interested in the UK extension sessions are urged to preregister at http://ukforestry.org or by calling 859-257-7597. UK programs are free with Kentucky Wood Expo admission. Admission is $7 at the gate or $5 by calling 502-695-3979 in advance. Admission for children ages 6 to 12 is $5 and children under 6 are admitted for free. For more information on this year’s expo, contact Kentucky Forest Industries Association at 502-695-3979 or michele@kfia.org.